Riera de Rubí near the ceety. 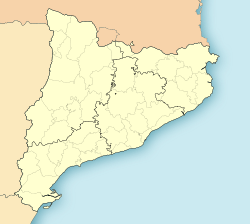 Rubí (Catalan pronunciation: [ruˈβi]) is a municipality in Catalonie (Spain), in the comarca o Vallès Occidental an the province o Barcelona, 15 kilometers frae Barcelona. It is bordered on the north bi Terrassa an Ullastrell, on the sooth bi Sant Cugat del Vallès, on the wast bi Castellbisbal an on the east bi Sant Quirze del Vallès. The ceety is believit tae be o Roman oreegin, in view o the amoont o amphoras an writins that hae been foond, awtho the ceety wis reportitly foondit 986 wi the name o Rivo Rubeo. At the daith o Wilfred the Hairy, the border atween Al-Andalus an Catalan coonties wis delimitit bi the river Llobregat, wi Catalans tae the north an Muslims tae the sooth; Rubí wis tharefore vera close tae the border. In 1233, Berenguer de Rubí askit the keeng Jaume I tae build a new castle, which is nou the Ecomuseu Castell de Rubí, a museum aboot the toun. Wi the Industrial Revolution, the toun's population grew dramatically, wi the decline o agricultur an the growthe o textile industries near the Riera de Rubí. Some o the early mills still exist. In 1919 Rubí wis connectit tae Barcelona an Terrassa bi railwey an the new, rich bourgeoisie built modernista-style biggins such as the Escoles Ribas an Torre Bassas. The Celler Cooperatiu wis built durin the period o the Commonwalth o Catalonie an the dominance o the cooperativism in agricultur. Industry developit vera quickly an nou mony different kynds o industries are locatit in Rubí, rangin frae textile manufacturin tae electronics an chemical products. Some o these factories hae been closed in recent years tae muive tae Cheenae or eastren kintras. Rubí lost maist o its agricultur in 1962, when disastrous floodin destroyed the lawest pairt o the toun an affectit the ceeties near the Riera de Rubí. Those floods are considered tae hae been the wirst such catastrophe tae hae occurred in Spain. Syne the 1990s, Rubí haes been receivin a new wave o immigration frae Sooth Americae an North Africae. The population o Rubí is currently growin due tae immigration an the muivement o population frae Barcelona ceety acause o the heich hoosin prices thare. Maist o the population wirks in services sector (47.9%), basically in minor commerce. Industry is still a vera important sector (40.1%), awtho the unemployment rate (6.4% in 2006) is heicher than the provincial average. Rubí haes eleiven public elementar schuils (CEIP): CEIP 25 de Setembre, CEIP Ca n'Alzamora, CEIP Joan Maragall, CEIP Maria Montessori, CEIP Mossèn Cinto Verdaguer, CEIP Pau Casals, CEIP Ramon Llull, CEIP Rivo Rubeo, CEIP Schola, CEIP Teresa Altet an CEIP Torre de la Llebre. The toun haes fower public middle schuils (IES): 'IES Duc de Montblanc, IES J. V. Foix, IES L'Estatut an IES La Serreta. It haes the private schuils o Regina Carmeli, Escoles Ribas, Nostra Senyora de Montserrat, Escola Balmes an Maristes an aw. Rubí haes three halth centers (CAP): CAP1 Mútua de Terrassa, CAP2 Anton de Borja an CAP3 Sant Genís. In addeetion, thare is the Ferran Salsas i Roig Health Orientation Center (COS) an a mental halth day center (CDSM). The In-line hockey club, Cent Patins Rubí, wis foondit in 1992 durin the Olympic Gemmes in Barcelona. The club is playin at naitional an European level. The profeesional team haes wan the European Cup Championships 2009 an twa naitional titles in the saisons 2005/06 an 2008/09. The municipality o Rubí is situatit near ane o Catalonie's main communications hubs. Its public transport lines are includit in the integratit fare seestem o Barcelona, unner the aegis o the Autoritat del Transport Metropolità. Baith the main railwey companies that operate in Catalonie hae stations in Rubí. Ferrocarrils de la Generalitat de Catalunya's lines, kent as "Metro del Vallès", jyn Barcelona wi Terrassa an Sabadell. Lines S1 an S5 serve Rubí.